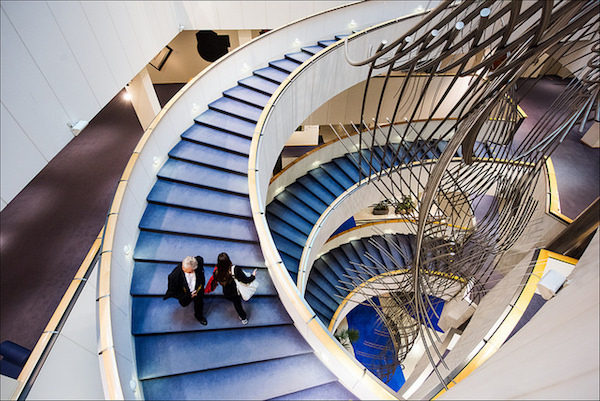 "Up and down the European Parliament staircase." via Flickr. On 1 June the European Parliament passed a resolution on an essential cause that deserves to be seriously addressed. The cause in question is the fight against anti-Semitism. But this resolution, which adopted one of the two proposals advanced — the one coming from the conservative (EPP), liberal (ALDE), and Socialist (S&D) groups — poses serious problems. Indeed, this resolution is based on the definition of anti-Semitism promoted by the International Holocaust Remembrance Alliance (IHRA). The serious flaw of this definition is the fact that it strays from its own particular object in order to make multiple references to the state of Israel. It is not a Parliament’s job to give definitions of notions that are the object of a vast historiographical debate and hundreds of critical studies. And the IHRA text is far from being an indisputable point of reference. It declares at the outset that "Manifestations [of anti-Semitism] might include the targeting of the state of Israel" and mentions this state nine times, even though the authors do feel compelled to add that "criticism of Israel similar to that leveled against any other country cannot be regarded as antisemitic." When the IHRA text then gives "examples of antisemitism in public life, the media, schools, the workplace, and in the religious sphere," it puts four examples of hateful, stereotyping, fantastical and negationist arguments on the same footing as seven other arguments that concern the state of Israel, its "current policy" and its "actions." The resolution voted through the European Parliament invites member states and the EU’s institutions and agencies to adopt and apply this IHRA definition of anti-Semitism. While we may well consider that in some of the attacks levelled against Israel there is an anti-Semitic tendency, in no sense can criticisms of Israeli government policies be reduced to anti-Semitism. Unless we are to undermine both the fight against anti-Semitism and racism, and the freedom of opinion necessary to the very functioning of our democracies, we cannot allow the one thing to be assimilated to the other. This is the argument to which the MEPs of the left-wing and ecologist parties (GUE-NGL and Greens-EFA) gave voice in the European Parliament, refusing this instrumentalisation of the fight against anti-Semitism. They instead sought to inscribe this struggle in the essential, universal fight against all forms of racism and discrimination. Yes, we can fight against anti-Semitism and defend the Palestinians’ rights. Yes, we can fight against anti-Semitism even as we condemn the Israeli government’s colonial settlement policy. The fight against racism, anti-Semitism, and discrimination cannot be divided.